The south end roti shop is the go-to place for jerk chicken. Melissa Buote likes it so much, she goes twice. Melissa Buote No awards for presentation, but the food at Rani’s brings a warm spice to winter days. The beiges, browns and bolted-down seating at Rani's Curry & Roti Stop will never look like anything but a Tim Hortons. But if you close your eyes when you walk in, you'll see nothing but the rich golds and copper of curry. The smell is a delight, an inviting combination of spices like cloves, allspice and thyme. It's the middle of the week and my friend Stephen and I pop in for lunch on a whim. Craving the warm spice of Caribbean food on what is a very cold afternoon, we're excited to explore the vast menu of roti and curry dishes. After a quick glance at the menu, Stephen orders the potato roti with mutton curry ($11.50) and I get the parata roti with jerk chicken ($9). The prices seem a little high at first, but we're both impressed when the huge portions arrive. The parata roti itself is thin, with a chewy, almost doughy, quality. But it's packed with the jerk chicken, which isn't incredibly spicy, but has a pungency and depth in the rub that gives the dish a meatier quality than I expect. The aromatic mutton curry is also tender and delicious. Potatoes give the portions a real stick-to-your-ribs heaviness. We're more than satisfied when we leave. In fact, two days later we go back for another lunch, eager to try some more menu items. As they were on our first visit, the servers ---who spend the bulk of their time behind the counter or in the kitchen---are really friendly and happily answer questions for us, letting us in on the secrets behind their rice mixes and letting us know about bone-in options for curries. We start with fried plantains ($3) and split a beef Jamaican patty ($2.50), adding goat curry with kithrie rice ($13.50), a dahl roti with chicken curry ($9.50) and an order of the jerk chicken ($7) I so enjoyed on our earlier visit, since today they have thighs on the bone---jerk chicken at its best---ready for consumption. 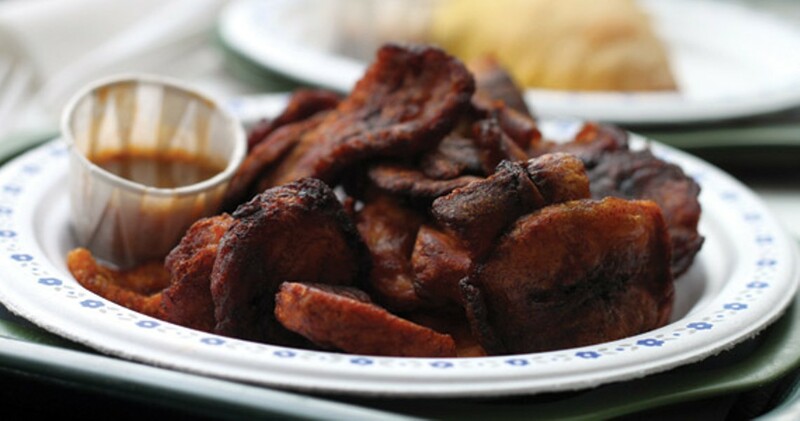 The plantains are well-browned, cut quite thick and very chewy. Many of them stick together in starchy lumps. I prefer plantains a little crisper on the outside, with a good dash of salt, and these lack seasoning. A little cup of tart hot sauce on the side makes up for it. The Jamaican patty, made in-house, has a thicker crust than I expect, lacking the flaky crispiness of other patties I've eaten. Instead it has a soft, fluffy quality. It's different, but I like it. The crumbly beef mixture falls on the dry side, but has a nice, subtle heat to it. The hot sauce---which I admit is a bit of a cure-all elixir for me---fills in a few flavour gaps here, too. The goat curry is fantastic; the silky, tender meat is delicious with the earthy potatoes and curry sauce. It's even better with the kithrie rice, which has a mix of coconut milk, spinach and split peas adding a subtle, mellow flavour that complements the more complex curry. A simple salad rounds out the plate, a light, crisp addition to the starchy meal. The chicken curry is just as tasty, though the chicken is a little tough. The dahl roti is a little less chewy than the parata roti, and just as delicious. The roti itself is huge, too much for me too finish, so I give up halfway through to save room for a few mouthfuls of the jerk chicken, before wrapping up the leftovers to bring home for another great meal. The perspective and menu at Rani's is just different enough from Caribbean Twist to make them a nice south end companion to the north end's roti shop. Not that the city can have too much roti. Or that two restaurants is somehow a glut. But it's nice to have options.